Bangor University’s students have given the University an overall satisfaction rating of 90%, placing the University among the UK’s top 15 non-specialist universities, the traditional institutions who offer a broad range of subjects. These results come from the annual independent National Student Survey (NSS). 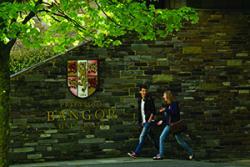 Rivalling institutions such as Oxford and Cambridge universities by delivering the same levels of student satisfaction for the third year running, senior staff at the university put the success down to the high standard of teaching and the student experience at Bangor University, along with the University’s focus on identifying and addressing any problems that may arise for individual students. “These results reflects the excellent standard of teaching available at Bangor University and are a wonderful endorsement of our activities and our values. The data should provide valuable information to prospective students." 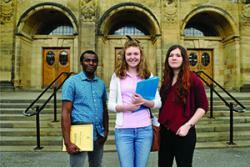 The NSS results are drawn from a poll of around half a million graduating students at each university in the UK. They provides the most comprehensive feedback on the student experience at each institution, drilling down to school, course and programme level and also drawing on broader information about areas such as teaching and assessment and feedback. The results showed the University at 4th in the UK for the academic support given to students; and placed in the top 20 for both teaching and assessment and feedback. Seven subjects at the University achieved a 100% satisfaction rate, placing them at the top of their subject table in the UK: English Studies; Geology; Journalism; Linguistics; Medical Technology; Music; and Ocean Sciences. Journalism is 1st in the UK for the third consecutive year. A further seven subject areas are top 10 in the UK: Psychology (4th in UK); Electronic Engineering; Agriculture; Media Studies; Finance; Philosophy; and Iberian Studies. Impressively, seven programmes have achieved 100% student satisfaction: BA English; BA English with Creative Writing; BA Astudiaethau Plentyndod; LLB Law (2 years); BSc Diagnostic Radiography; BSc Geological Oceanography; and MEng Electronic Engineering.